LinkedIn is different than other social media outlets because its focus is on advancing your career, but you have to make it work for you. Using keywords, making quality connections and being an active and knowledgeable presence can go a long way toward landing that new job. Finding a work-at-home job is a challenge. You have to navigate scams and schemes to find the legitimate work, and then you have to compete with hundreds of applicants to attract the attention of the employer. One of the best ways to find work and present yourself as a valuable employee is through LinkedIn. Although it’s usually lumped in with other social media sites such as Twitter and Facebook, LinkedIn is quite different. It is a professional business networking site that allows greater opportunity to post detailed profiles showcasing your skills and experience. 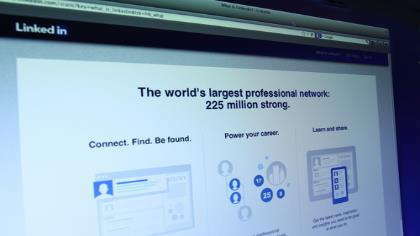 However, with over 65 million members, LinkedIn requires a strategy to get noticed. Here are a few tips to using LinkedIn to find a work-at-home job. Make it easy for potential employers to find you by using the words and phrases they’d use to find people to fill a position. If you’re interested in doing virtual assistant work, then you want to use words in your profile such as “virtual assistant,” and “virtual support.” If you specialize in a specific area, use those keywords, as well. For example, “virtual marketing assistant,” or “virtual PR assistant.” Start by using keywords in your headline, which appears after your name. For example, “Sally Sue: Virtual Support Professional.” Other places to incorporate your keywords are in your summary, work experience, skills and interests. Other social networks focus on quantity over quality, but at LinkedIn, it’s not about how many connections you have, it’s about the quality of connections. In fact, once you hit 500, LinkedIn doesn’t post the actual number of connections you have. At LinkedIn, your goal is to network with people who can help you and whom you can help, as well. Start by connecting with people you know. Next, join groups related to the job(s) you’re interested in getting. There are over 200 groups for virtual assistants. Through the groups, you’ll meet others to connect with. Although LinkedIn is about finding jobs or expanding your business, you won’t get far by posting self-centered messages asking for a job. Instead, join in the conversation, ask questions, share your expertise and build relationships. Although being involved in a group is a great way to connect, don’t forget to post updates and share helpful information on your profile. For example, a virtual assistant might post a link to an article on how virtual support can save businesses money. The idea is to become known as an expert and a resource. Although you can ask for endorsements or recommendations, it’s best to start by giving them to others and hoping they’ll respond in kind. Once your profile is up and you’ve established yourself with your network, you can use the job search options to find work. When you click on the “Job” tab at the top of the page, LinkedIn will give you a list of jobs you might be interested in based on the work experience and skills in your profile. Below that, LinkedIn gives you a list of jobs in your network. Although LinkedIn offers some great resources, when it comes to working at home, not all the suggestions will be a fit, but you can search for jobs at the top of “Job” page. LinkedIn isn’t immune to scammers and people looking to recruit you into a business opportunity. Do your due diligence to research job opportunities before making any commitments to work or giving away too much information about yourself.